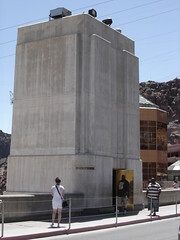 I was quite surprised to be walking along the Hoover Dam and see restrooms in these concrete structures on the top of the Dam. Somebody, somewhere did some excellent planning. I did not have the good fortune to have to use one of these facilities (but my husband did). I’m a little bit sad that I didn’t think to actually go check them out. Oh well, that may be a reason to have to go back out that way someday. The Hoover Dam was just as cool as the Grand Canyon – a fascinating feat of human engineering. It was spectacular to see from the air! 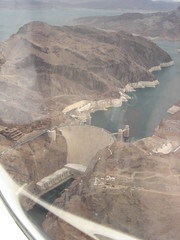 I also was amazed by the Hoover Dam Bypass – US 93 Project. You can see the concrete supports for the new bridge in this picture. Of course, I’m guessing the new bridge will mean that this view of the Dam from the air will be much different in years to come. Before the trip to Las Vegas, I counted the Tower of London and the Andes Mountains in Venezuela (from a trip I made there as part of a foreign exchange program in high school) as two of my favorite spots in the world. The Grand Canyon has easily added itself to the list! Picnic LunchOriginally uploaded by ScruffyNerf. The favorite part of my recent trip to Las Vegas was the helicopter ride that my husband and I took to the Grand Canyon. 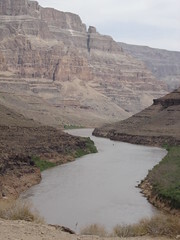 I was absolutely amazed and awed by the canyon – and by the helicopter ride. 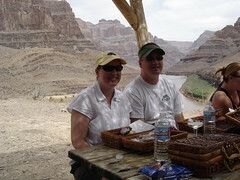 As part of the trip, we had a picnic lunch at the bottom of the canyon – turkey sandwich, a bag of snacks (Doritos for me – yuck! ), a chocolate chip cookie and champagne all served in cute picnic baskets. It was totally worth all of the money that I paid for it!!! This is a picture of my husband & I enjoying our picnic lunch. You are currently browsing the Life as I Know It blog archives for the day Saturday, July 7th, 2007.